Before I share my review of this adorable book, I want to share a little more information about why this book was created. This book is dedicated to the Masheheni children and the Imani Project. The first orphaned child Chantal Garceau (Co-Author of Cozy Toes For Baby) sponsored through the Imani Project became the inspiration for her Charitable Enterprise, Chantal’s Little Shoes. Chantal’s Little Shoes is a volunteer-driven company. 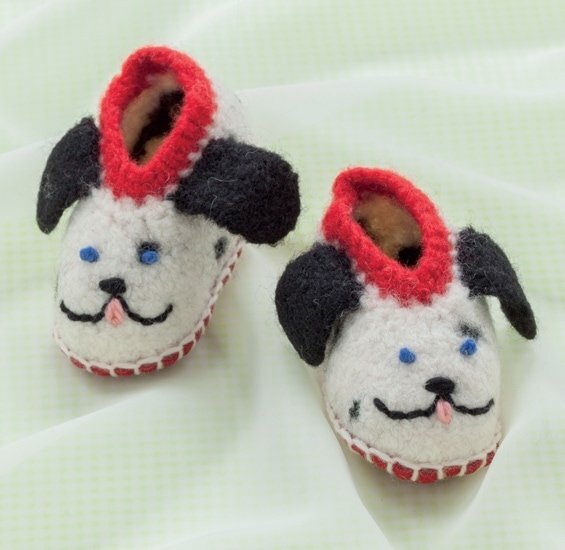 The baby shoes are sold online and in Seattle-area markets. These sales allow Chantal’s Little Shoes to sponsor 10 orphaned children with foster families in their own villages and provide them with food, clothing, medicine and school supplies. “Give a little love …give a little shoe”. Proceeds from your purchase of Cozy Toes For Baby are used to support sanitation, health and education projects in the children’s communities. 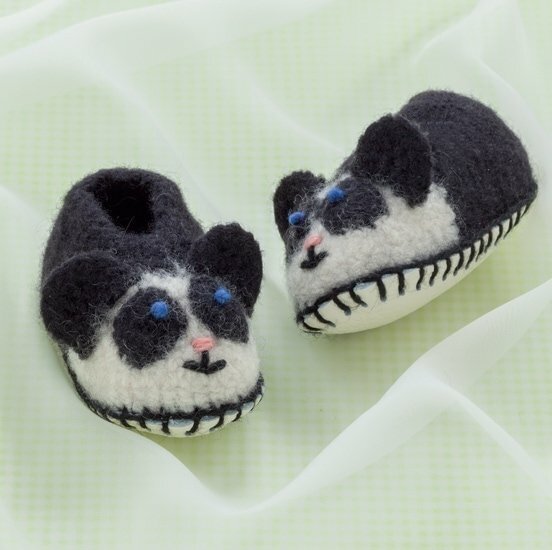 I want to try to make a pair of these adorable little shoes! Each shoe is made from the same basic pattern and has a leather sole. It is also felted! I have wanted to try felting for a very long time. The basic little shoe pattern is sized to fit 0-3 months (XS), 3-6 months (S), 6-12 months (M), 12-18 months (L) and 18-24 months (XL). 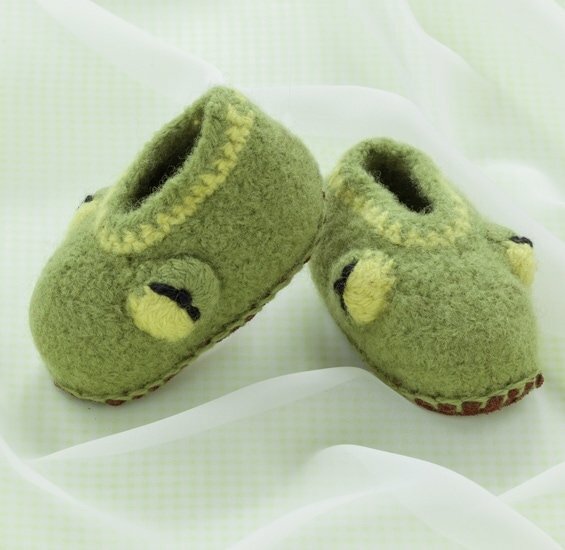 The instructions included provide the specific measurements you need to reach for each size, both before and after you have felted the little shoes, as well as after you have added the little leather soles. All sizes need 1 skein of 100% wool yarn of medium worsted weight. A 5 mm (H-8) hook is suggested. Since these are made to fit it is highly recommended a gauge swatch be done. The instructions to make the swatch are also included. The book includes a diagram you can use to compare the finished size of your shoe to the specified size for the pattern. This makes it very easy to determine if you have crocheted the appropriate size! The variations listed above, require additional skeins and colours of wool yarn so it is best to double check which colours you need for your pattern before you begin. At the beginning of each of the above Pattern Variations the specific size(s) and measurements are provided. I know this is a repeat of information contained elsewhere but I prefer this – it makes it easier for me to follow a pattern when everything I need is in one spot and I do not need to flip back and forth (or scroll back and forth in the eBook version) to find what I need. Felting Instructions are provided on pages 34 – 36 and there are a lot of fantastic tips and tricks provided I have never seen or heard of before. The soles are explained on pages 37 – 38. To me this book is valuable for the felting instructions and sole making instructions alone! All the abbreviations and basic stitches are included from page 40-45. Diagrams are included for the stitches, as well as, the detailed written explanations. 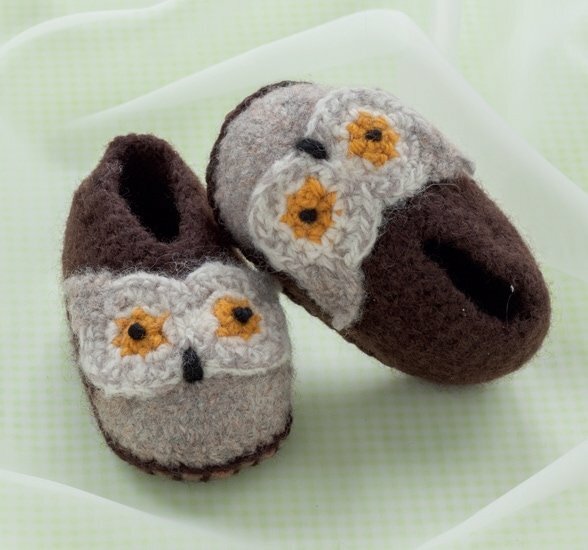 Cozy Toes for Baby also includes ‘A Gift Insert to Copy and Give’ on page 39 and the patterns for each size of the leather soles are provided on pages 46 and 47. You can find more out about the Authors (p 48), Online Sources (p 48) and Acknowledgements (p 48) at the end of this 48 page book. As an added bonus there is an online project available to those who purchase this book – an online download link is provided to receive the Teddy Bear Shoes! 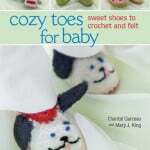 Cozy Toes for Baby is an excellent book and an excellent resource if you want to try felting and adding leather to your crochet projects. I definitely recommend this book and I really want to try to make a pair of these little shoes! 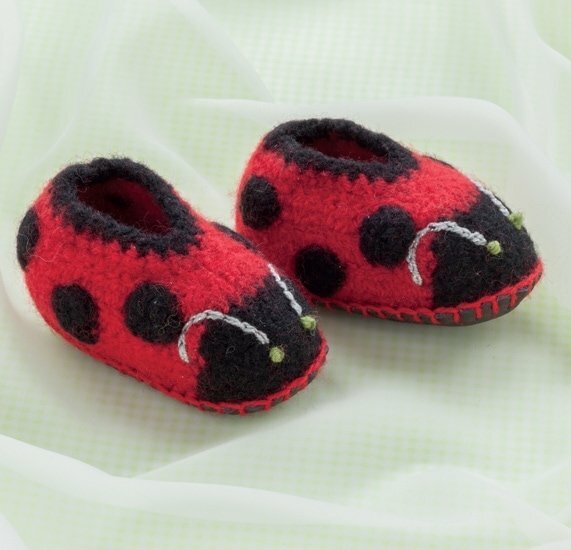 I love the Little Froggy shoes and the Little Ladybug shoes! I only wish they were in MY size too! 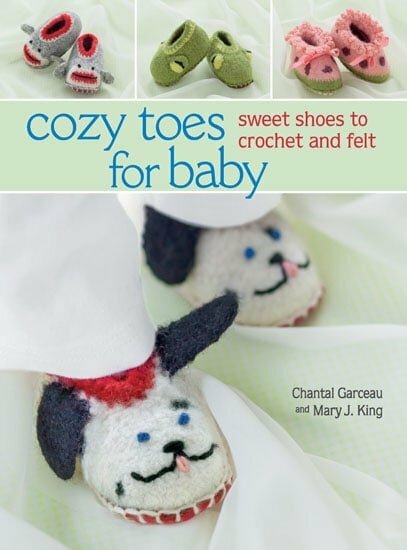 To purchase your own copy of Cozy Toes for Baby, Sweet Shoes to Crochet and Felt please visit one of the following links. Or if you prefer, you can pick up a copy from Amazon. Thank you for reading my review of Cozy Toes for Baby 🙂 I’m not sure I would want sharks on my feet either to be honest but my son Drew is fascinated by them! Thank you for reading my review of Cozy Toes for Baby! Thank you for visiting Oombawka Design and entering my Blog Anniversary Giveaway! Hi Michele! I’m happy you enjoyed my review of Cozy Toes for Baby! SO NEAT! CUTE AND USEFUL TOO! THIS BOOK IS A HANDY RESOURCE! THANKS FOR SHARING! I love that this book details how to felt crochet items. However, what I like best about it is because the patterns and shoes made from them are sold for such a wonderful cause! I love this book. My great grandson loves sock monkeys and I will be making the sock monkey booties for him and I now have a 1month old great granddaughter to make booties for. This seems like a great way to try out felting. Definitely something I want to try! too cute. Almost makes want the cuties so i can have an excuse to mske them. These are so cute, and I love that proceeds from the book are,in part, sponsoring children. very cute! love these! thank you! The only felting I ever did was by accident- wool sweater in the washer, OOPS! Oh well, my LITTLE daughter at the time enjoyed it until she outgrew it, then I cut it up and was able to make 3 very warm hats! I have never felted and I agree that if this book has instruction for felting and making a good sole for the little shoes, it is worth the price. Even more since the money is going for such a great cause. I haven’t learned to felt yet, or even what it is really, but when I do, I’m getting this book. Those booties are adorable! I have got to get this book and try felting. I have never tried felting (my yarn skills are pretty basic), but your review of this book has made me think I should give it a try. the shoes are soooo cute! 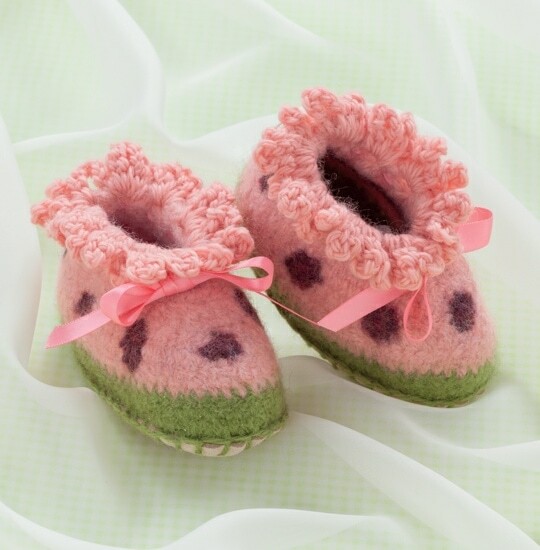 love the inspiration behind the book, creating cute little shoes for a good cause! I really love the owl design for these slippers! Felting makes such a sturdy slipper, and much more resilient to constant wear and tear. They make items much warmer too! I think I’m going to add this adorable book to my Christmas wish list this year! Thanks for sharing! Black and white puppy shoes are the cutest! I haven’t ever tried felting, but I’m interested in learning to do it. shame I don’t know set of 1st grand child due in Oct. They look lovely.